The point is, regardless of how your vehicle ended up with leather upholstery, you paid for it! 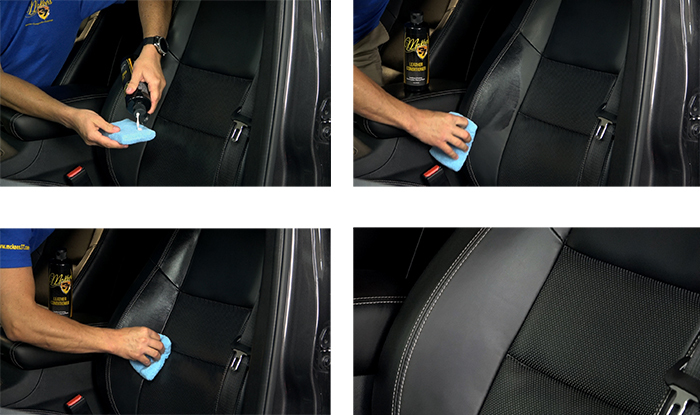 Keep it protected with McKee's 37 Leather Conditioner. It's just what he been looking for 5 I used a little of it to test it & was happy w/it. To be honest w/you I purchased it for a Christmas present for a my son-in-law to use on his Mercedes leather interior. Which I know he'll approve of it to for its quality too. Smells Great 5 This is the new Leather Conditioner formula. First off it smells great, like leather of course. It leave a soft satin sheen, very subtle. Was easy to apply and spread out. All In One Leather Lotion 5 The best interior cleaner/protectant I have used for my Silverado as well as customers vehicles! Leaves a nice subtle look and isn't greasy like most other products! This is definitely my go to product for interior's! Pros:Not greasy, easy to apply, not shiny. All-In-One Leather Lotion 5 Other leather conditioners would make my leather feel slippery/greasy, After application they would cause me to slide on my seat. Leather Lotion makes leather soft and rich for a like new appearance. I am very happy with the smell of it as well. New favorite 5 I thought I'd give this a try even though our only car with leather is my son's car. Once I read the instructions I noticed it said 'equally good on interior vinyl. Wow was I impressed. It make leather and vinyl look showroom ready, the smell is of a mild leather smell, and it's never greasy or too shiny. It's my new go to product. Smells Awesome! 5 Out of ease I decided to try this All-in-one Leather Lotion. It works awesome. Using a microfiber pad just rub in a small amount then wipe off any excess. Leaves a nice matte finish & a pleasant scent. Will use more often to keep the car smelling new. Easy Leather Care 5 This is perfect for me because I love leather, but I don't have a lot of extra time to spend taking care of it. It is not greasy so the leather looks like new and doesn't get too shiny. Good one step product. 5 Made my leather seats super soft without being greasy. Love the new leather scent. I use it on my couch and leather jacket too. Pros:Nice scent. easy 1 step.